In a 2017-18 NBA season filled with excitement and entertaining storylines, high up on the list is the Portland Trail Blazers emergence into the No. 3 seed in the most competitive Western Conference we’ve seen in years. While players like Paul George, Jimmy Butler and Paul Millsap made their way west, the Oregon Trail alongside Damian Lillard and C.J. McCollum did not seem to pique any of their interests. But night after night, Portland’s backcourt continues to impress. Led by Lillard’s exceptional playmaking and shooting ability, Rip City has won its last 10 games. After consecutive disappointing seasons finishing in the No. 8 seed and losing in the first round, the team has had quiet offseasons between. The biggest move the team made in the past two seasons is the deal involving Mason Plumlee and Jusuf Nurkic, the team’s big man. Since the All-Star break, Lillard is averaging a hearty 31.2 points per game and shooting 43.5 percent from behind the arc. That’s not mention that Lillard has attempted over 10 three pointers per game in that span, making his percentage from that range all the more impressive. The Trail Blazers have also seen great production from their 1B guy, shooting guard McCollum. Since the All-Star Break, McCollum has been shooting 43.6 percent from three, to go along with 21.4 points per game. The team has played noticeably better and more physical defense during the same stretch, propelling it into contention with teams that nobody thought it would be able to compete with. Since the break, Portland has defeated a handful of playoff teams, including the Golden State Warriors, Minnesota Timberwolves, Oklahoma City Thunder and Miami Heat. Most impressive of all, however, is Lillard’s play. Despite being selected as a reserve for this season’s All-Star Game, the chip on his shoulder is ever-so-present. Lillard has Steph Curry’s shooting paralleled with Russell Westbrook’s grit and edge, alongside a fourth quarter presence that may surpass both. It’s almost become nightly routine that late in the game Lillard decides to knock down a three from the logo, finish at the rim or set up Nurkic for an easy one. Take the game in Los Angeles, where the Blazers were down eight points with 6:06 to go in the game, Lillard scored 16 points in a row to lead Portland past the Lakers. I watched Staples Center become quieter and quieter after Lillard knocked down miraculous shot after miraculous shot. 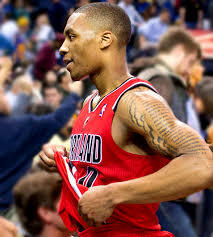 Or take Monday’s game at home against Miami, where Lillard posted 32 points and 10 assists in a Blazer win. Few players in the league have the “will to win” attitude that Lillard emits through emotion and confidence in the fourth quarter. It looks as though he’s accepted his home, and is ready to embrace it. Not only do the Trail Blazers hold the No. 3 in the Western Conference to themselves, but they are on pace for the first 50-win season since LaMarcus Aldridge’s departure. Lillard Island is in effect, folks. In the team’s last 10 games, Lillard leads the NBA in total points, three-pointers made and is second in the NBA in plus-minus only to Rudy Gobert and James Harden. While the top two seeds in the West are held tightly by the Houston Rockets and Golden State Warriors, Portland a great chance to not only have home court advantage in the playoffs, but generate significant momentum going into them as well. We’ve seen Lillard’s ability to duplicate these exceptional performances in the playoffs, when he hit the series-winning three against the Rockets in 2014. I’m not saying I envision the Trail Blazers beating Houston or Golden State, but that backcourt will be a matchup nightmare for any playoff team in the Western Conference, especially with the way they’ve been playing. After all, the Oregon Trail was pretty unpleasant.